Christmas Scratch is a great Christmas themed scratch card and they don’t get an easier or more simple to play than this game. This game is a great game to play if you are in the mood to play a quick and easy Christmas game. The Christmas Scratch game has nice animations, music and gameplay. The goal of the game is to get Santa Claus down one of the three available houses chimneys. If Santa makes it into the house then you will win a cash prize. Autoplay and quick pick features are available for players to take advantage of to play more games in less time. To play Christmas Scratch head to Prime Slots(Doesn't accept Americans - get $25 No Deposit for Christmas at US-Friendly Classy Coin instead.). You will first need to register an account. This process is free, quick and painless which means you’ll be enjoying all of the Christmas themed games available here including the Christmas Scratch game. After you register you are now ready to find the game. But before you go looking be sure to take advantage of the many great promotions and bonuses that Prime Slots hands out to their new players and returning ones also. 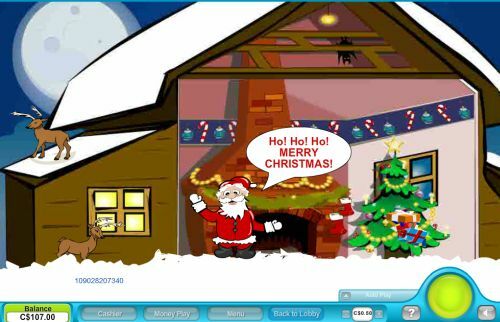 Christmas Scratch game is a nice quick, basic and extremely easy game to play. Good betting limits for this game also. Players can wager as little as $0.50 or as much as $10.00 per game. The full list of betting limits are; $0.50, $1.00, $2.00, $5.00 and $10.00. You will first see Santa in the sky in his sleigh being flow by a few of his Reindeer. You job is to select one of the three house for Santa and the gang to land on. If Santa fits down the Chimney then you will win, if he doesn’t then you lose your bet. This game has some nice Christmas animations which make the game look and feel great to play. If Santa fits down the chimney then he will drop off his presents. If not he may get stuck in the chimney, catch on fire from the chimney, get bumped back from presents shooting out of the chimney plus more funny outcomes. To speed things up you can choose to have the game Auto play for you or even have the game quick pick which house to land on.